“out to play – where is my buddy?” . . . .
Tilly has just come running up the creek bottom from the barn. 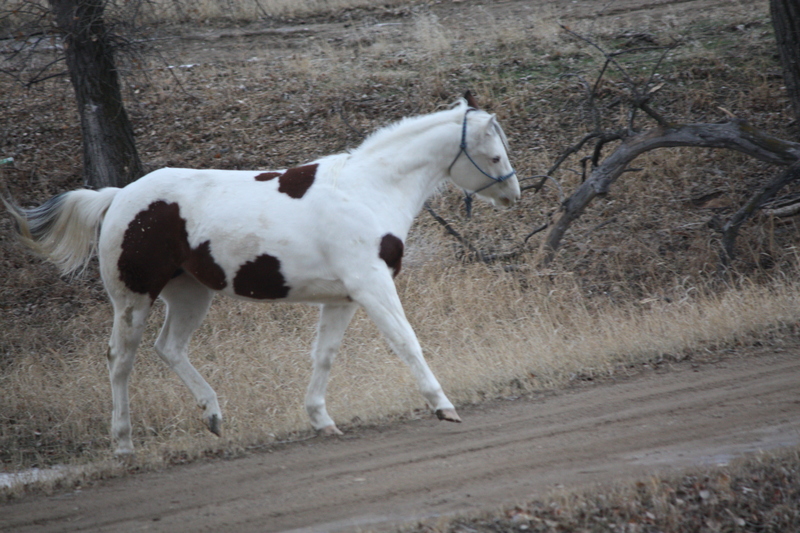 She goes out to “free range” in the pasture in the mornings and we take her back to the barn in the early evening. She is on a mission to find her good buddy. “think I’ll just kick up my heels !” . . . . . .
On this particular morning she is full of spit and vinegar. The weather is changing and she responds to change in the atmosphere. 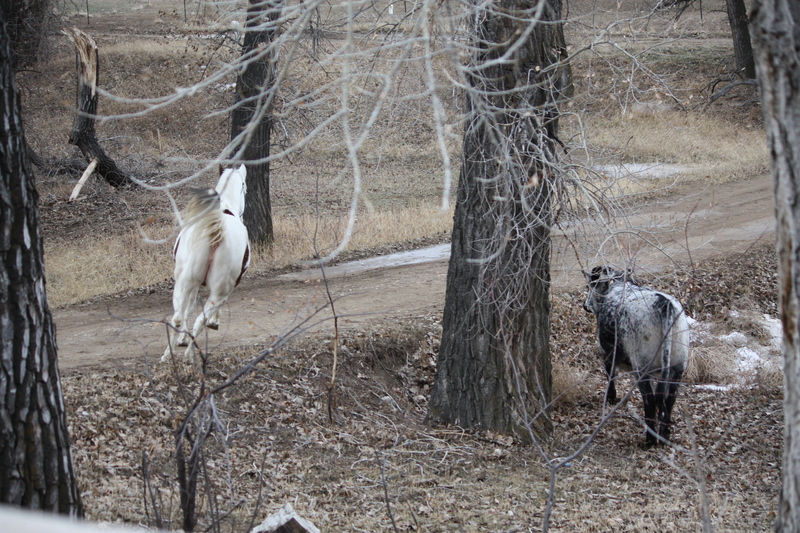 Only one hoof is touching ground and I was only able to capture her on her descent back to earth – she wanted to buck and snort a bit to let the world know she has arrived. 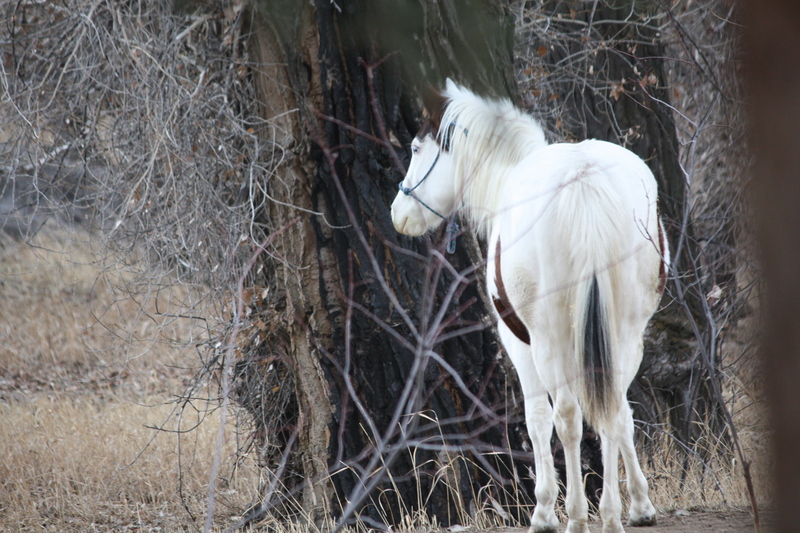 “I think I see my buddy!” . . . .
She is headed back down the road after spotting Feed Lot in the bottom grazing on twigs and leaves. She is on her way to “round him up” as she likes him to accompany her on their daily rounds. “C’mon, let’s go!” . . . . Typical hungry steer, he is paying little attention to her and has his nose buried in a pile of leaves. He will lose this battle of wills, as usual. “I will bite you, buddy!” . . . .
Tilly is good at using her teeth to get his attention. Her little “love nips” usually get him moving. 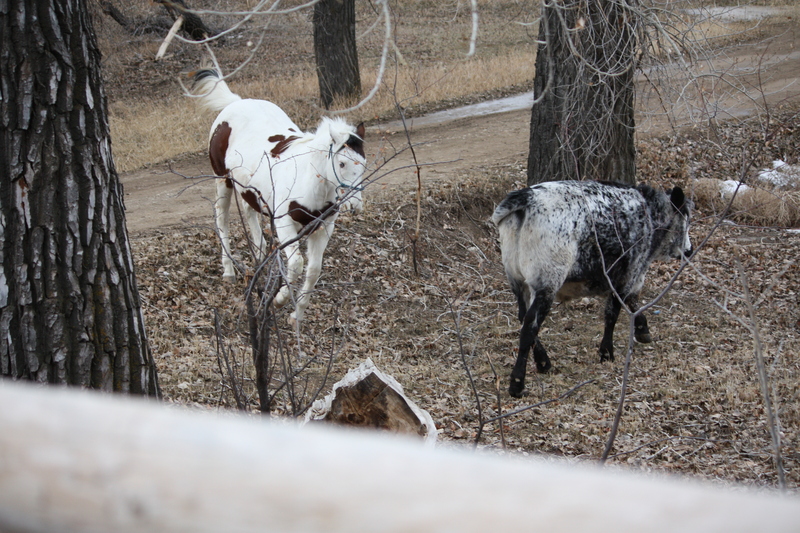 If not, she will rear up and wave her front hooves at him, dance around him and push up against him. “I’ll run circles around you” . . . . 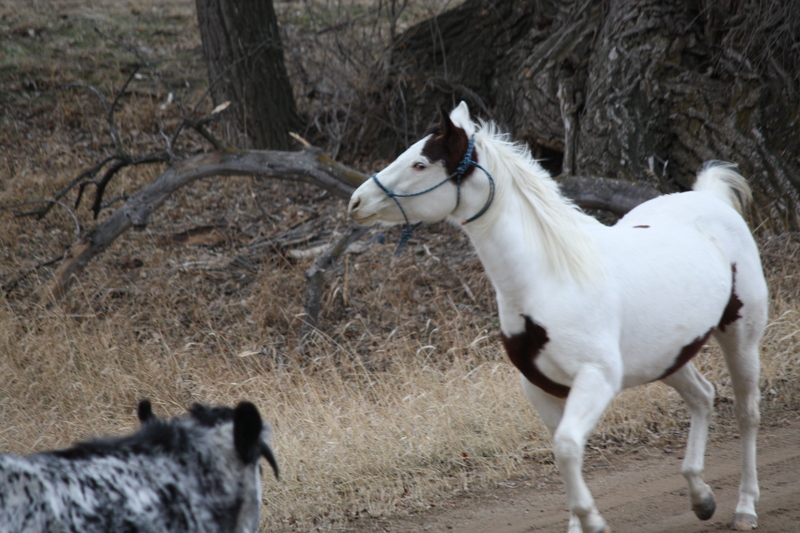 Growing impatient, she races up and down the road and circles him in an effort to get him headed up the lane to visit the neighboring horses. Feed Lot is a bit reluctant to go along with her schemes this morning. “How can I go play if he won’t come?” . . . .
She is growing impatient and tears off up the road again. Then she stops to think about her next plan of action. 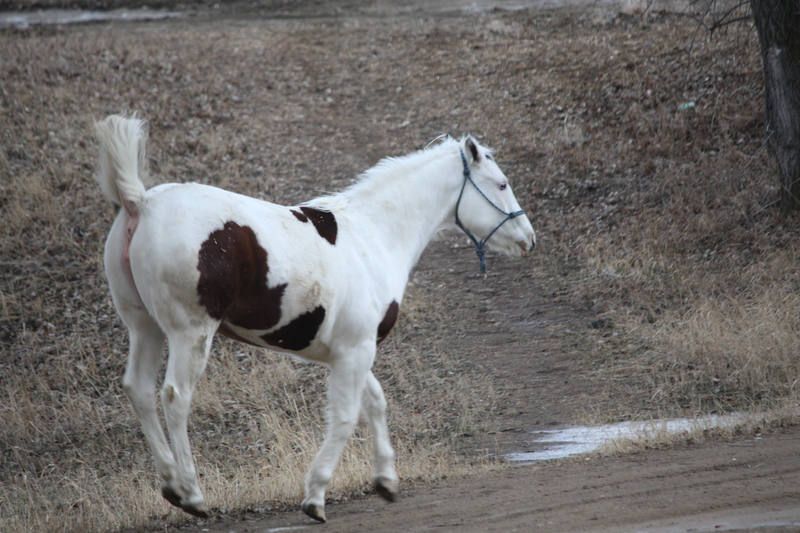 If Feed Lot won’t come with her up the road, perhaps she needs to find something else of interest. “I think I’ll think about it” . . . .
Tilly stands in repose for several minutes, pondering what she wants to do next. She wanders up to the driveway where I am freezing with no coat trying to catch her antics on camera. “Guess I’ll take a chomp out of this old wagon bed” . . . . The remains of an ancient wagon rest in the grass adjacent to the driveway. 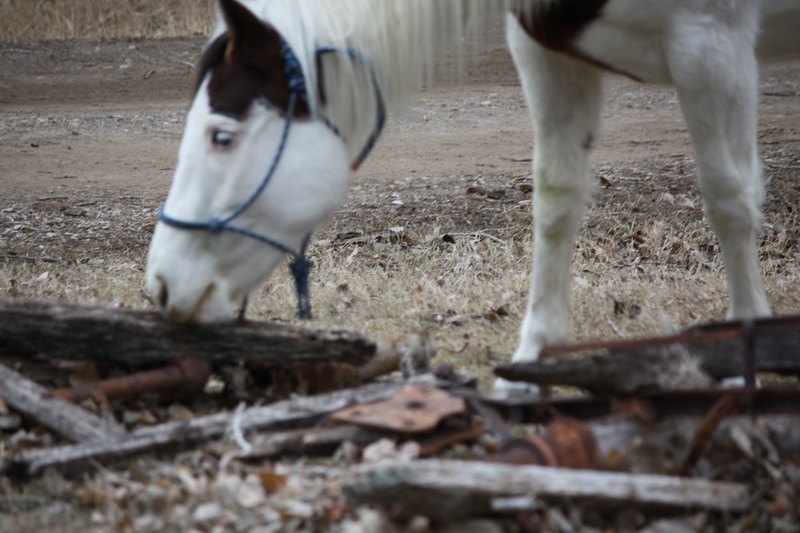 Tilly’s curiosity gets the best of her and she noses and sniffs, finally taking a bite out of the ancient wood. “Wonder if I can reach that plant inside the fence?” . . . .
A stalk of rabbit ears in the flower garden inside the fence draws her attention. 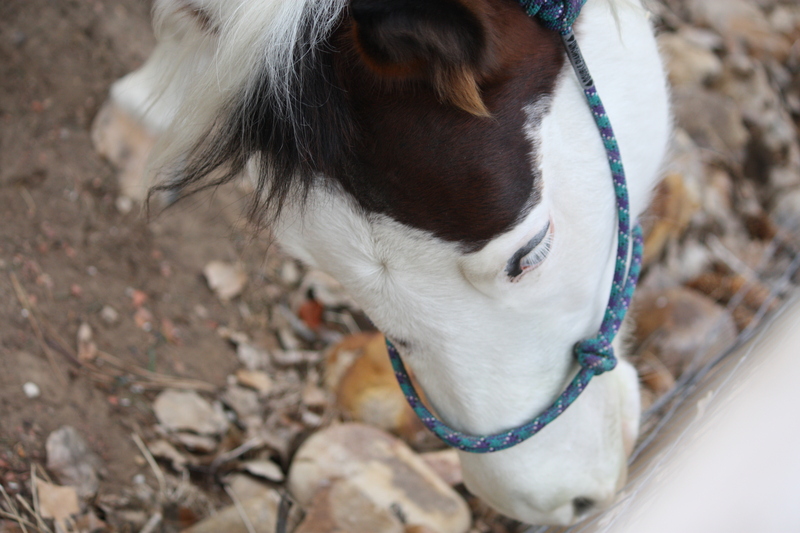 She works hard to try to draw it through the wire so she can have a taste. “Got an apple for me?” . . . . Finally, she comes forward to greet me and check to see if I have anything yummy she might like. We don’t feed her treats unless we can drop them in her bucket or feed bunk, but she never fails to check pockets. 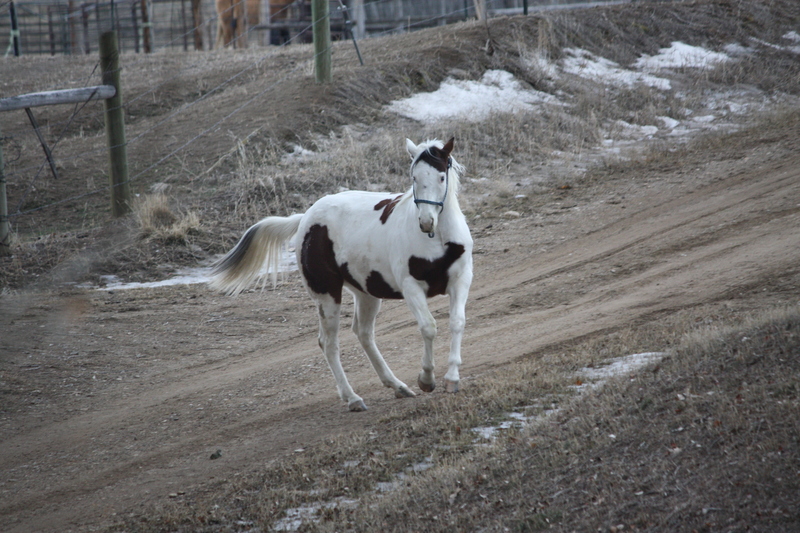 “Can we go now?” . . . .
Tilly races off to try once more to get Feed Lot on the move. She is giving him a look that seems pretty clear she means business this time. “Oh alright already!” . . . .
Tilly gets her man. 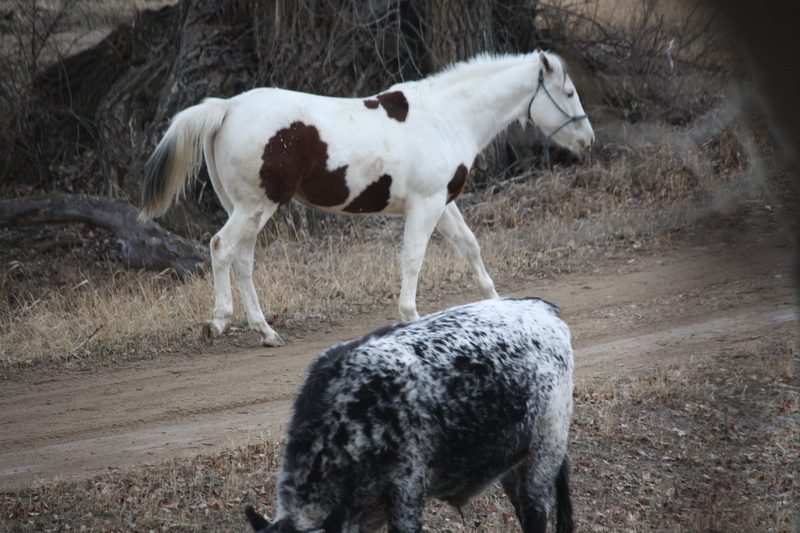 Feed Lot is resigned to following her up the lane, much against his wishes. 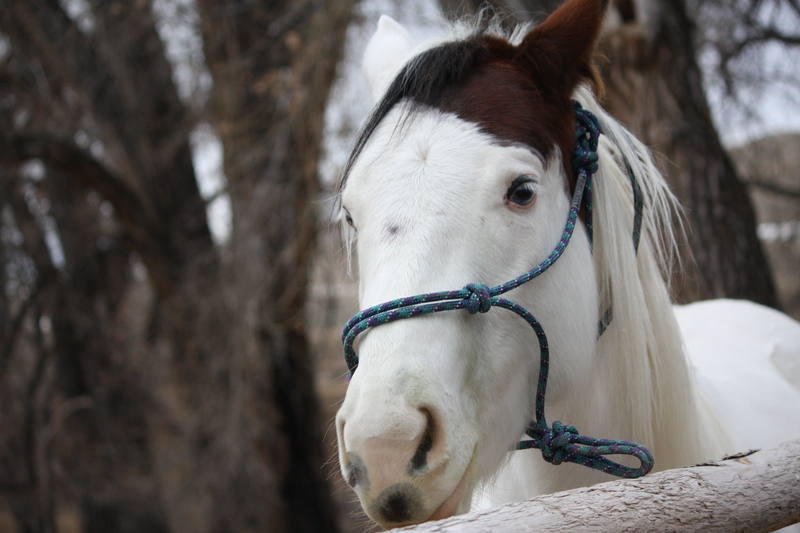 A cold wind is blowing and he would prefer to stay down in the trees or better yet, go to the barn and clean up a little bit of last night’s hay. “We’re off!” . . . .
Up the lane at break neck speed, Tilly leads the way. 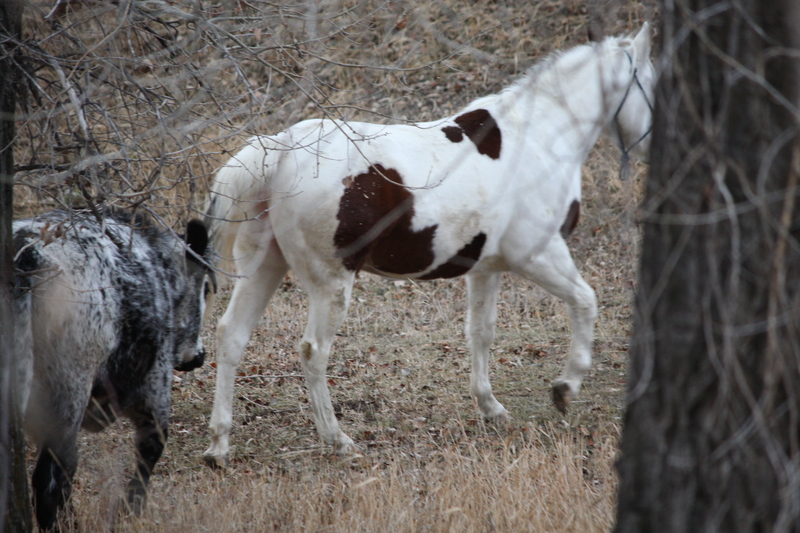 Feed Lot is resigned to letting her have her way with him and plods up the road behind her. How can he let his good friend down? This unlikely pair became great pals in November of last year when they were thrown into the corral together as weanlings for a week. 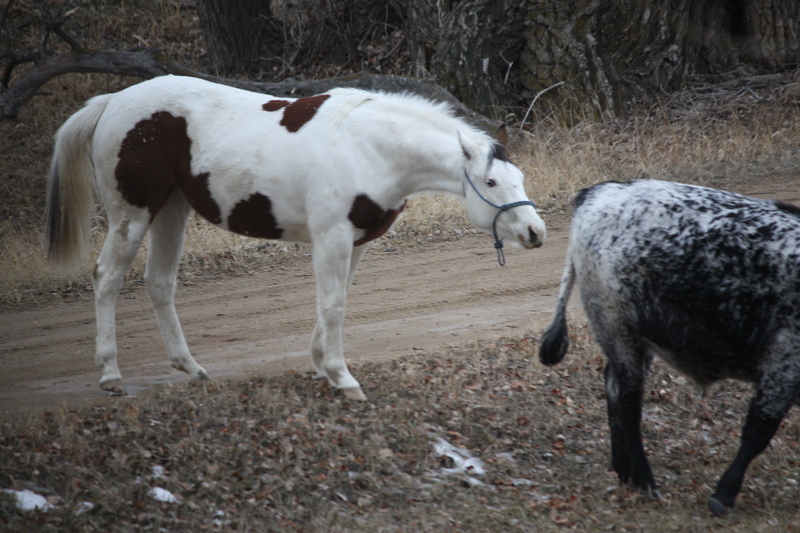 They became inseparable, and Feed Lot hangs around outside the barn where Tilly spends her nights. His company keeps her calm and most of the time is a good influence. But not always. He tried to board the horse trailer while I was loading Tilly recently, and it got a bit crowded, to say the least! 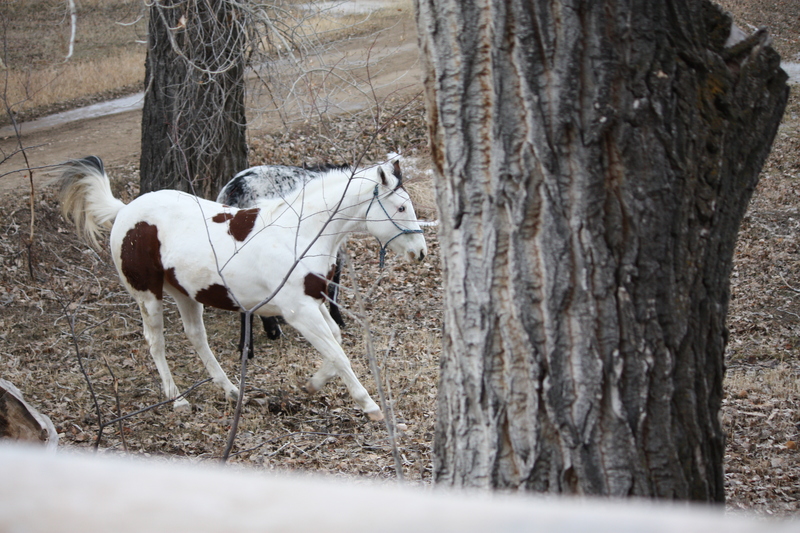 This entry was posted in Wildlife blog and tagged paint filly and longhorn steer by bygeorge. Bookmark the permalink. Oh, what a great capture of words and photos to describe life with Little Ms. Tillie! Goodness gracious, she’s an adolescent! Bossy, too!